As a result of industrialization and the burning of fossil fuels, the pH of the earth's air and soil has been lowered to acidic levels around the world. To address the issue, Chinese designers, Hao Tian, Huang Haiyang, and Shi Jianwei have envisioned a series of floating acid-purifying skyscrapers that could improve air quality and provide fresh water and fertilizer as well. These PH Conditioner Skyscrapers are designed for the Chinese city of Chongqing, but they could be used around the globe to clear the air of acid rain. Hao Tian, Huang Haiyang, and Shi Jianwei’s PH Conditioner Skyscrapers received an honorable mention in the2013 eVolo Skyscraper competition. The fantastical proposal soaks up damaging acidic pollutants and turns them useful resources while cleaning the air. The designers envisioned the project for Chongqing, which is bordered on three sides by mountains and is heavily polluted from industrial activity resulting in poor air quality and acidification of plants, soil and water. 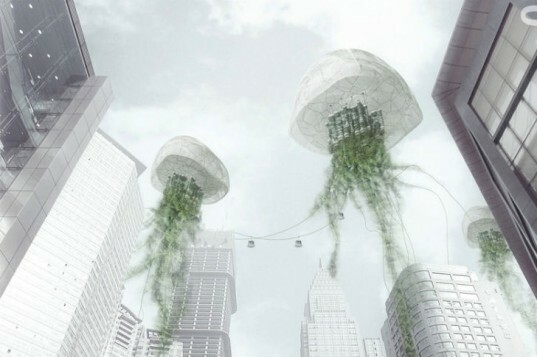 The floating jellyfish structures absorb pollutants from the air, and through a number of internal processes, turn them into beneficial resources for the city. Hao Tian, Huang Haiyang, and Shi Jianwei's PH Conditioner Skyscrapers received an honorable mention in the2013 eVolo Skyscraper competition. he fantastical proposal soaks up damaging acidic pollutants and turns them useful resources while cleaning the air. The designers envisioned the project for Chongqing, which is bordered on three sides by mountains and is heavily polluted from industrial activity resulting in poor air quality and acidification of plants, soil and water. 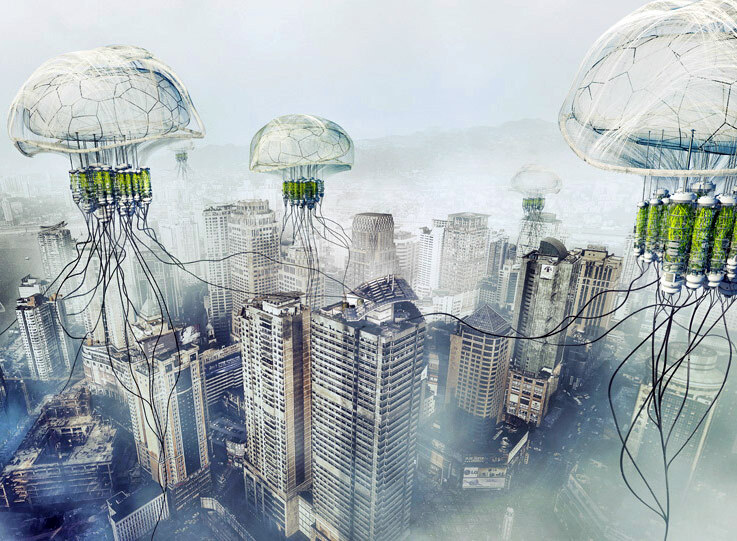 The floating jellyfish absorb pollutants from the air, and through a number of internal processes, turn them into beneficial resources for the city. Floating in the air about 200-300 meters up, the PH Conditioners are located at the best level to absorb pollutants. Hydrogen is used for buoyancy and porous membranes in the air bags take in pollutants and direct them to the core purifier. Nitrogen-fixing microorganisms produce an alkaline substance to neutralize acidic materials into a fertilizer that is released through the tentacles to help plants grow. Leftover purified water is reclaimed and then used for irrigation and other processes. Over time, a city's air will gradually improve and the resources created by the skyscraper can be used to create a richer and healthier environment through the development of more vegetation. The floating skyscrapers can be transported as necessary to different locations within the city or to other cities in need of fresh air.